10207 exit lights and emergency direction lights. 1. 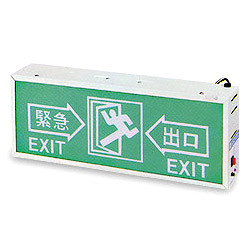 Name: exit light emergency direct, light. 2. Ser.num afe 203 afe 203t. 3. Cell lead-acid battery: 6v,2.3ah x l.
5. Cell daylight lamp, iowx 1. 6. Size: cm 38.4x18x5.8 weight 1.33kg. 7. Discharge time over 180 minute shell fireproof.